The AirAsia Red Hot P1 Seat Sale is Back! - All Chucked Up! 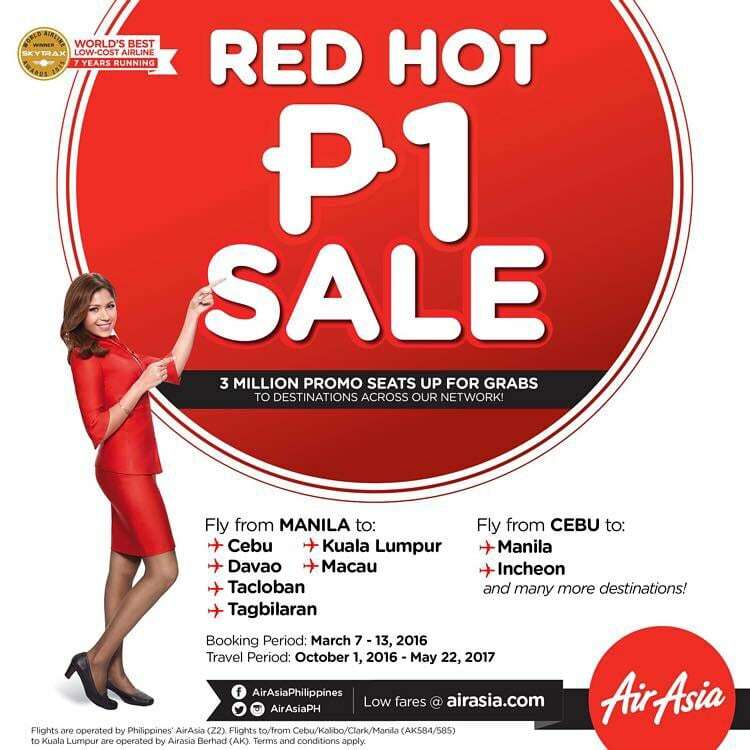 You are Here >> Home >> News >> The AirAsia Red Hot P1 Seat Sale is Back! Philippines AirAsia is out to cause a fun and frantic frenzy again because the AirAsia Red Hot P1 Seat Sale is happening again! AirAsia and AirAsia X are offering 3 million promotional seats for its highly anticipated Red Hot Seat Sale* which will connect travellers to over 100 destinations across 22 countries including flights to/from Manila, Kalibo, Palawan, Bohol, Cebu, Davao, Tacloban and international destinations in Korea, Malaysia, China, Macau and Hong Kong. AirAsia Red Hot P1 Seat Sale is here! These promotional seats being offered for the AirAsia Red Hot P1 Seat Sale start from P1.00 base fare, excluding applicable taxes and fees. It is available for booking from March 7-13, 2016 on the airline’s website – www.airasia.com for the travel period from October 1, 2016 to May 22, 2017. This promo is also available on AirAsia’s mobile site mobile.airasia.com. According to AirAsia’s Group Chief Commercial Officer Siegtraund Teh, this time around, they are pleased to offer 3 million promotional seats. Guests may grab this perfect opportunity to make advance travel plans and enjoy extra value for their money. They have introduced many new and undiscovered routes throughout the region and grabbing a promo seat is the best way to discover new destinations! In addition, Siegtraund Teh says that guests from around the region can take advantage of AirAsia’s Fly-Thru service to connect to many exciting AirAsia X destinations such as Auckland, Sapporo, Tokyo, Gold Coast, Sydney and more. In conjunction with this special promotion, AirAsia X’s Premium Flatbed to all AirAsia X destinations are also on sale. AirAsia BIG members and AirAsia BIG Prepaid MasterCard card members can earn 1 AirAsia BIG points for every P28.00 spent while booking the promo seats on www.airasia.com. Bargain hunters can also save up to 50% and more when they book their hotel with promo seats on www.airasiago.com. For added convenience, AirAsia strongly encourages guests to pre-book their baggage allowance at the time of flight booking to enjoy lowest rate. Alternatively, guests can use the “Manage My Booking” function to pre-book or add more baggage allowance at airasia.com up to 4 hours before the scheduled time of departure. Guests are reminded that each passenger is only allowed ONE piece of carry-on cabin baggage weighing no more than 7kgs and must be within the 36cm(h)x56cm(l) dimension. Hurry! Take advantage of the AirAsia Red Hot P1 Seat Sale and book your flights now! Keep updated with Philippines AirAsia’s latest promotions and activities via Twitter (@AirAsiaPH), Facebook (AirAsiaPhilippines) and Instagram (@AirAsiaPH). *Red Hot P1 Seat Sale is for base fare only and does not include airport taxes, fees and other optional services. Terms and conditions apply. ‹ Sunday Brunch at The Ranch at Spectrum, Fairmont Makati › Awesomely cool gadget accessories from Digits Trading to make your summer even hotter!